In a rapidly changing world, what role might the bee play in our future? And who will preserve its own? It’s a quote – often misattributed to Albert Einstein – that presents an apocalyptic vision for both mankind and Manchester. The city’s most ubiquitous emblem is the worker bee, a symbol of the city’s hardworking past as the “hive of industry”. The bee appears on the City Council and the University coats of arms, on street bins and the Palace Hotel clock face – even the famous Boddingtons logo features this Mancunian icon. Yet in a world of increasing demand on natural resources, changes in climate and rapidly advancing technologies and urbanisation, what role might the bee play in our future? And who will preserve its own? Sam Beath is Senior Conservator at the Manchester Museum and one of four University beekeepers who maintain two urban beehives on top of the Rutherford building on campus. According to the Bumblebee Conservation Trust, insects are estimated to contribute over £400 million a year to the UK economy and €14.2 billion (£12 billion) a year to the EU economy through pollination of crops. And bees, especially in urban environments with a variety of foraging sources, play a vital role in conservation and pollination. As part of its Environmental Sustainability Strategy, the University is about to launch its Living Campus Plan to protect and enhance local biodiversity within our growing urban campus. “The plan will improve habitats and connectivity for bees and other wildlife by increasing plant diversity and reducing pesticide and herbicide use,” explains Julia Durkan, Sustainable Campus Officer at the University. Observing the Rutherford hives reveals a complex societal structure: each hive has one queen and a group of male drones, alongside smaller, female worker bees. “Every hive is unique and its temperament is directly influenced by the queen,” says Sam. “They have a fascinating form of communication – often referred to as the ‘waggle dance’ – a figure-of-eight ‘dance’ that allows successful forager bees to tell other colony members where patches of flowers are so they can collect nectar and pollen,” explains Sam. 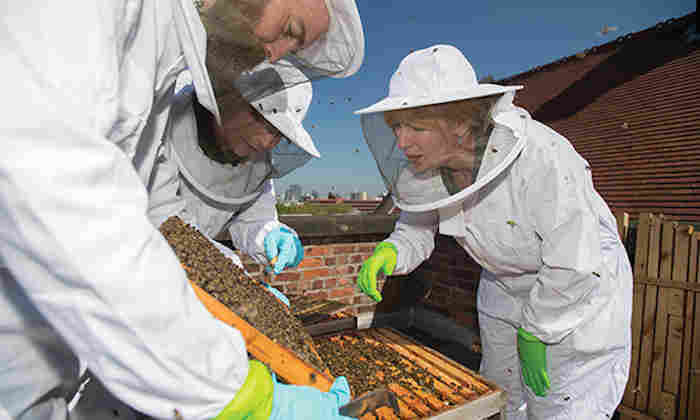 It’s hoped that by drawing on expertise from around the University and other beekeepers and safeguarding bee habitats around campus, the hard-working, highly adaptable dancing insect – so synonymous with Manchester’s identity – will continue to thrive in urban beehives on rooftops and in open spaces throughout the city.